Locate the following control system components and layout their locations on an appropriate nonconductive surface (e.g. plywood or plastic) to permit wiring connections as shown in the power distribution diagram on the FRC Kit of Parts Website. Plan the positions of the components to leave space to access the various connectors. Cut 2 pieces of ¼” material (wood or plastic) to 15.75" x 10.5" and drill holes per Appendix A (or match drill when aligned with robot chassis). Mark off the outside 1/2" on both short sides and one long side of each piece as shown in the layout image below. These sections will sit under the chassis flanges and must not have components overhanging. Note that for a non-robot Control System test bed, teams may elect to use only one board. Layout the cRIO, Power Distribution Board, Digital Sidecar, 120A Main Breaker, 12V/5V converter and (4) motor controllers per the image. Jaguars are shown in the image as these are the largest of the legal controllers, other controllers may be used and should fit in the same locations. Ideally all 4 controllers should be of the same type, if mismatched paris are being used, make sure to have the pairs located together (Victors with Victors or Talons with Talons, etc.). If only using two motors, it is recommended to place one controller on each board, in the location near the unmarked edge of the board. This will put the controller closest to the motor it is controlling, allowing direct connection of the motor wires. Insert modules into the cRIO slots 1-3 as outlined in the table above. The other modules listed in the table are optional and may be used to expand the IO capability of the system if necessary. Using wood screws, fasten all components to the board. Attach terminal lugs to a battery connector. 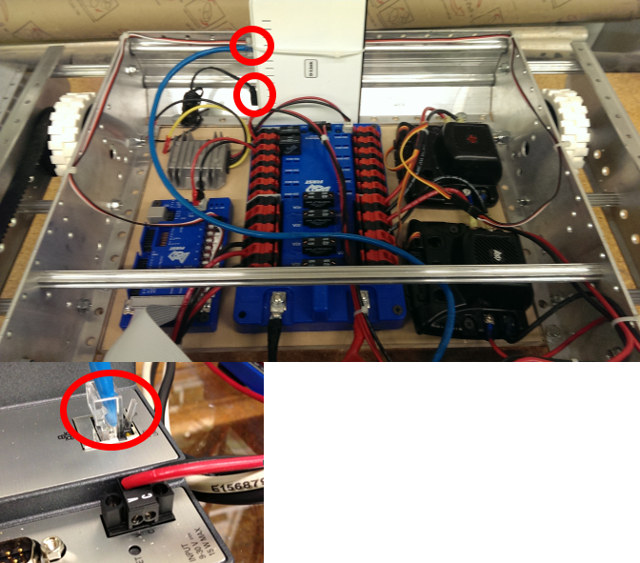 Then, attach the battery connector to the Power Distribution Board and the 120A Main Breaker. Connect the 120A Main Breaker to the positive terminal on the PDB using red 6AWG wire and terminal lugs. Connect the 12V/5V Converter to the regulated 12V terminal on the PDB using a WAGO connector. Connect the cRIO power input to the regulated 24V terminal on the PDB using a Sauro connector and 18AWG wire. Connect the Analog Breakout (mounted on the 9201 module in Slot 1 of the cRIO) to a 20-amp position the PDB using a WAGO connector and 18AWG wire. 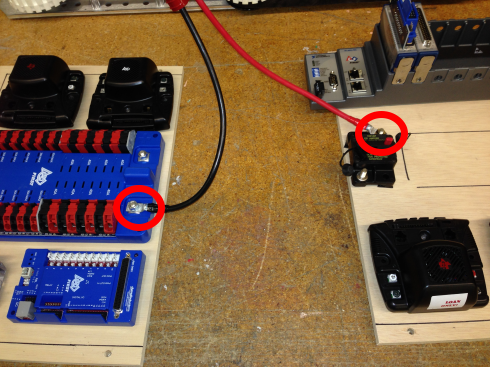 Connect the Motor Controllers to a 40-amp position on the PDB using 12AWG wire. Also, connect the fan wires to the power input terminals on the motor controller. Remove the wall wart from the Wireless Bridge power cord. Then, connect the power cord to the 12V/5V converter (yellow wire to black-with stripe wire). Connect the Digital Sidecar to a 20-amp position on the PDB using a WAGO terminal using 18AWG wire. Connect the Robot Signal Light to the “RSL” terminals on the Digital Sidecar. Then, create a jumper between the “La” and “Lb” terminals on the RSL. Connect the 9403 module (in Slot 2 of the cRIO) to the Digital Sidecar using the 37-conductor cable. Insert 20-amp and 40-amp Circuit Breakers into positions on the PDB. Note that, for the 40A fuses, the lightning bolt graphic points towards the positive terminal supplied power by that breaker. All negative terminals on the board are directly connected internally. 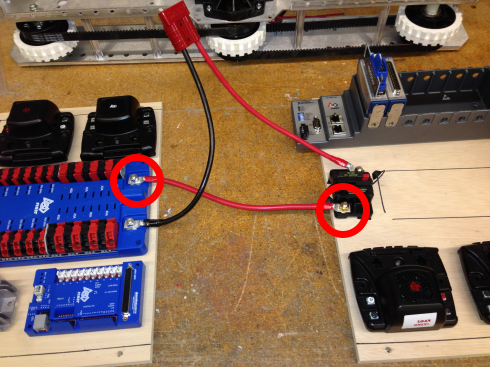 Connect PWM cables as shown in one of the two steps below, depending on the number of speed controllers on the robot. If using 2 speed controllers, use a regular 3-conductor cable (PWM cable) to connect the Digital Sidecar (PWM OUT Ports 1 and 2) to the Motor Controllers. Make sure to take note of the proper cable orientation on both ends (all FRC legal speed controllers connect with the black wire towards the inside of the controller as shown). Also make sure that the male end of the cable seats fully inside the receptacle on the speed controller. 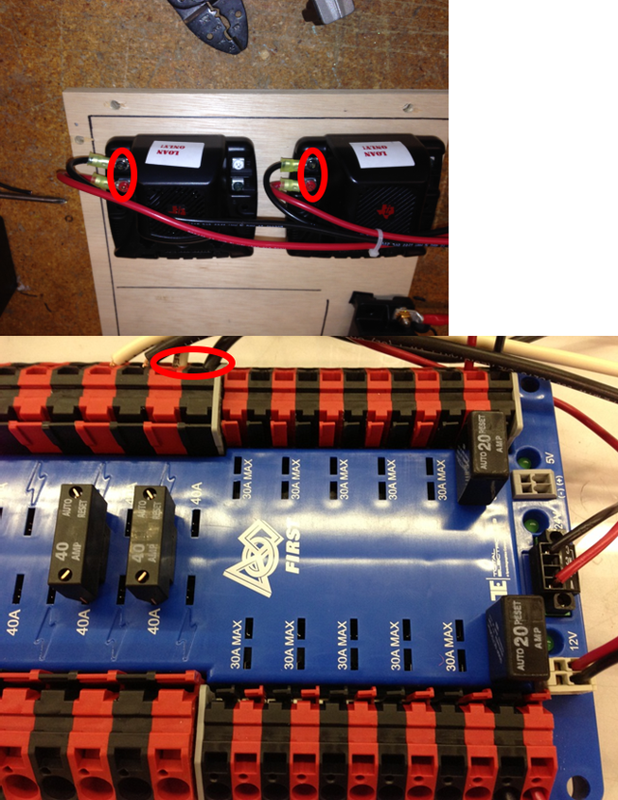 If using 4 motor controllers attach two regular PWM cables to the Digital Sidecar as shown in the 2 Controllers images above. Then attach a PWM Y-Splitter cable to the end of the extension as shown above right (Black->Brown, White->Yellow). Plug the two ends of the Y-Splitter into the pair of controllers as shown (Brown wire towards the inside). Note that if you are not putting this Control System on a robot, skip this step. Attach the two boards to the robot (robot shown uses KOP Drive System). Note that temporarily removing some connections (i.e. 37-conductor cable) may make installation easier. Remember to remake all connections. Connect the Wireless Bridge power and to the Ethernet port on the cRIO. Secure the bridge to the chassis using zip ties. 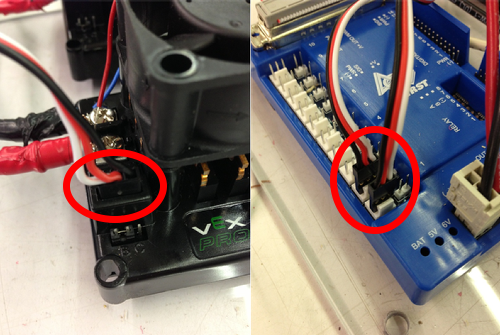 Use cable ties to manage wire runs, ensuring wires won’t get caught in moving robot parts (e.g. belts and wheels). Note that while many of the system components have been designed to tolerate reverse polarity input or short circuits on the output, not all components are protected from all wiring issues. Teams should take caution to check that all wiring is secure and correct before connecting the battery after any wiring changes. A best practice is to have someone other than the person that did the wiring check polarity and security on all connections (including the wires attached to the battery) prior to plugging a battery into the system.